If you’re looking to spend good money on a modified IS convertible, look no further than the $2,346 wheel/tire upgrade and add it to the $1,588 for springs, shocks and antiroll bars. The resulting $3,934 is a reasonable amount to spend on the 2010 Lexus IS 350C’s chassis, and here’s why. The forged-aluminum wheels reduce unsprung weight by 21 pounds (5.5 pounds at each 19-by-8-inch front wheel; 5 pounds at each 19-by-9-inch rear wheel), plus they look undeniably cool. Combined with supple Bilstein dampers, the new springs reduce ride height by 1.3 inches in the front and 0.9 inch in the rear. 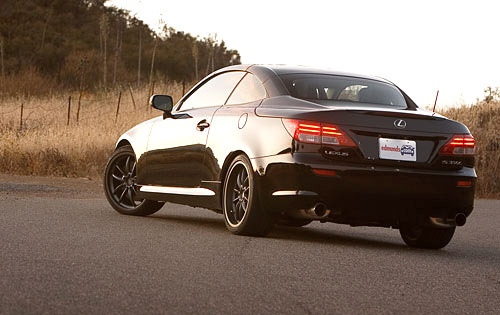 The antiroll bars are 105 percent stiffer up front and 320 percent stiffer in the rear. What does this all mean? It means the lower chassis is more responsive, the handling balance is a little livelier and the tauter suspension calibration works the new Michelin Sport PS2 tires harder. A coupe would have been a real looker.